Riding on unfathomable volumes of industrial expertise, we are offering an excellent range of Perforated Cable Tray Reducer. Manufactured with utmost precision by our deft professionals using high grade metal and advanced technology, this reducer is suitable for joining cable trays with different widths in the same plane. We are prominent traders of Reducer Joint Cable Trays that are catering the needs of different industries across the domestic market. 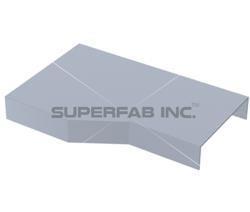 These joints are popular for their non-abrasive nature, anti corrosive property and high durability. We are offering FRP Ladder Cable Tray Straight Reducer to our Client. We are the foremost company engaged in offering Cable Tray Reducer. We are a leading supplier of Cable Tray Reducer. These are known for their quality and durability. They are used for connecting bigger cable trays with the smaller ones in an effortless and suitable manner. These trays are also available in perforations of different sizes to suit the client’s requirements. We offer Cable Tray Reducer to our clients. Reducer Left/Right Hand Perforated Type Cable Tray is available in various dimensions to suit the requisites of the customers. 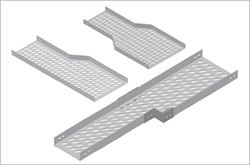 These Reducer Left/Right Hand Perforated Type Cable Trays can be availed at most competitive price.